As a piece of spin, the apparent leaking of Barcelona’s new ‘Catalan flag’ strip (Daily Mail) was an artless hoof up the park following the announcement the club is selling off of one of it’s prized traditions to Qatar Airways. The news that the Dohari football fetishists are to be the first corporate sponsors of the famous Blaugrana shirt hasn’t gone down well at an institution which used to regard itself as above such shameless stooging. And while a new nationalist kit design might go some way to deflecting this surrender of principle, the launching of the new away colours for the 2013/14 season would see FC Barcelona make a not insignificant political gesture in a year when Catalonia plans to vote on it’s independence from Spain. Barça themselves, however, remain adamant that they are nonpartisan, despite the team’s history as a figurehead of resistance against the repression of Catalan culture. Last season UEFA began taking disciplinary action against clubs who it felt were promoting overtly political viewpoints, and it’s unlikely anyone is going to presume that this new strip is an innocent homage to the famous colours of Partick Thistle. UEFA’s sudden nervousness perhaps stems from Europe’s current taste for austerity fuelled social unrest and this being inflicted on the benign modern football arena. However, regulating tribalism has always been problematic for European governing bodies, particularly with the number of clubs who’s politics are so intrinsic to their identity. Unlikely to count any members of the La Pen dynasty amongst its diverse support, Olympique Marseille enjoys a long-standing love affair with the city’s immigrant population. Allied with various ‘Antifa’ supporter groups, including Livorno and AEK Athens, OM proudly represents a prominent symbol against the far-right in the South of France. Controversial former chairman, crooner and Socialist politician, Bernard Tapie has made no secret his courtship of the Aux Armes in opposition to the French National Front. Seamlessly adjoining the city’s rich resource of cultures, the 2010 ‘African Heritage’ strip was an example of how the club openly demonstrates its harmonious diversity and celebrates multiculturalism in France. Initially formed in 1945 by members of the Serbian Antifascist League, Red Star Belgrade has since severed all ties with it’s eponymous Socialist background. Following the void left by the collapse of the Soviet Union, Red Star, like a number of football clubs in Eastern Europe, have since become a focal-point for ultra-nationalism. Fiercely anti-west, with historical links to Serbian paramilitaries, various fan groups have blurred boarders with far-right ‘patriot’ organisations intent of undermining the country’s pro-western government. In 2010, Red Star fans were prominent among supporter groups who, in an international qualifier with Italy, staged a violent sabotage-protest a day before a crucial vote on the Balkan state’s entry into the European Union. ‘Playing for a people and a cause’ is how Tommy Burns explained how he felt wearing the green & white of Celtic. 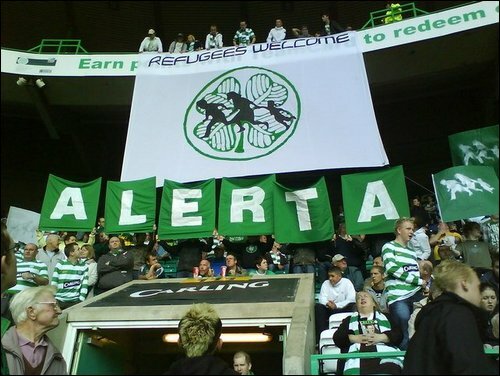 A team originally founded with the mandate to help support the unemployed of Glasgow, Celtic Park stands today as arguably the only prominent symbol in the city dedicated to the mass migration and integration of Irish into the west of Scotland. Celtic have maintained their identity over the years not only as a Catholic or an Irish institution, but as a club representing those who feel themselves outside the established order. Fans of the Bhoys are often characterised by their support for various international causes as well as their relationships with like minded St Pauli and Villarreal, while Palestine and Basque flags are as ubiquitous as the Irish tricolour in the stands at Parkhead. Legia fans are no strangers to living beneath the powerful yoke of an influential master. Once the team of the Polish Soviet army, they now find themselves under the umbrella of giant media conglomerate, ITI Group. The Legia support’s fanatical nationalism, confrontational ‘tifo’ displays and vocal opposition to Poland’s government are way off message for ITI and have resulted in mass bans at the Polish Army Stadium (renamed the Pepsi Arena). The dispute between The Legionnaires and their corporate media owners has since descended into a propaganda war, with the Legia fans engaging in the kind of establishment-bashing, anti-authoritarian protests used on the Communists during the 1980s. Unlike neighbours Real Sociedad, who until 2001 had an apparent ‘anyone but a Spaniard’ signing policy, Athletic’s’Basque-only’ approach to player recruitment has less to do with xenophobia or positive discrimination, but resembles more anti-globalisation, given their place in the context of modern football. The Bilbao team that twice played arguably the world’s most globalised club, Manchester United off the park last season were all born within what is regarded as the Basque country, regardless of ethnicity. The contrast between Athletic’s localist agenda and the hundreds of millions spent by their Galáctico peers also serves to highlight the issues and promote the strengths of Basque separatistism both domestically and abroad. If you’re described as an ‘Israeli hardliner’ then it’s unlikely you are going to have much of a reputation for tolerance and understanding. Proudly Zionist and ultra, ultra-nationalist, Beitar Jerusalem makes an afternoon at Millwall look like a support meeting for anemic vegan social workers. Formally sponsored by Benjamin Netanyahu’s Likud party, Beitar supporters maintain close ties with the settler movement as the club remains the only professional team in Israel yet to sign an Arab player. While Beitar fans’ continued racist chanting, violent targeting of immigrants and flaunting of Israel’s strict anti-discrimination laws have called many to question the seemingly tacit approval by the police, Jerusalem’s mayor and the Israeli FA. There can’t be many teams serving in the obscure regional leagues of Scandinavia with the same international reach as Assyriska BK. Founded by the large Assyrian community settled in Gothenburg, the team has become a prominent focal amongst the stateless Mesopotamic diaspora. Acting as an almost de facto international side in Swedish Division 2, its support maintains a fierce rivalry with Syrianska FC, a Syriac-Aramean club currently competing in Sweden’s top tier. An old-firm style rivalry between peoples which takes roots from events in 8th century Syria, but has now found a home in Gothenburg within Sweden’s football league. During the massive upheavals of the early nineties, football clubs and their supporters provided a crucial focal point in the re-forming of Croatian national identity. 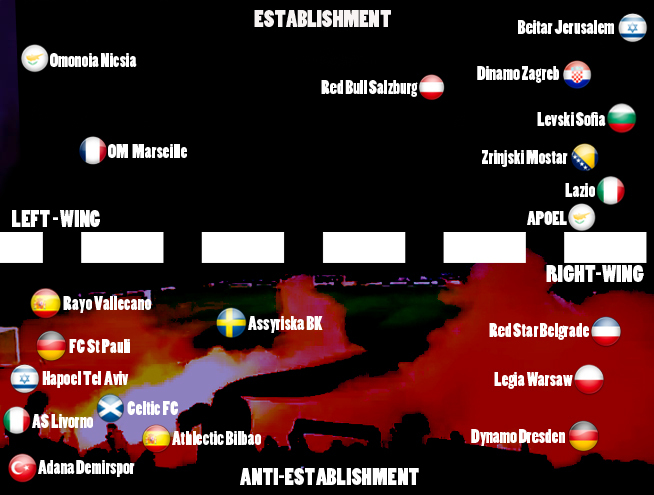 At the forefront of this movement were the increasingly influential supporters’ groups – The Torchidas from Hajduk Split and the Bad Blue Boys of Dinamo Zagreb. Croat film maker, Sasa Podgorelec, who documented the rise of Croatian Ultras, described the influence of BBB as ‘conscious enough of their own identity and brave enough to express their wishes on Croatian independence’. The Dinamo Ultras were even credited with playing a key role in leading popular support during the presidential election of nationalist politician and former dissident, Franjo Tuđman. Founded by the workers of the Turkish State Railway, Adana Demirspor has earned a reputation as a hotbed of political activism. Regular run-ins between fans and Turkey’s more right leaning politicians are the result of regular high-profile protests staged at the Adana 5 Ocak Stadium. Notably, following the assassination of the Turkish-Amenian journalist and human-rights campaigner, Hrant Dink in 2007, the chant “We are all Armenians, We are all Hrant Dink” has found it’s way into the Adana fans’ repertoire. Highly controversial banners in support of Marxist political prisoners and lefty love-in friendlies with the likes of A.S Livorno have also added to the club’s infamy among Turkish nationalists. On an Island defined by division, Omonia prides itself as a symbol of unity in Cyprus. 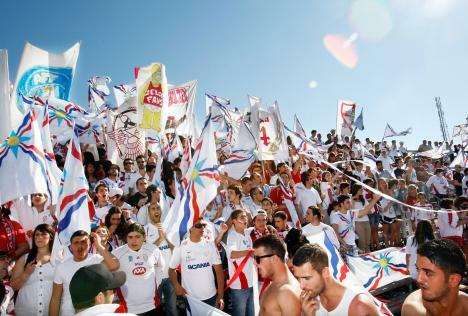 Campaigns for equal rights between Greek and Turkish Cypriots are a regular fixture in the stands of the GSP, fuelled by a burning opposition to fascism and Greek nationalism in the country. Commonly regarded as the working-class team in Cyprus, the club has long established links with the ruling AKEL Communist Party. A cosy relationship with the government that has many in Cyprus questioning the route of public money, via the chairman’s building interests, into Omonia’s relatively lavish transfer kitty. 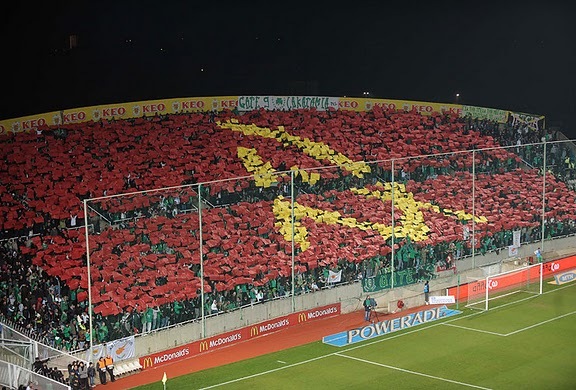 Omonia Nicosia hammer & sickle ‘tifo’ display.